Blue dart is India’s busiest courier company.It is mostly involved with the private business networks like eCommerce company, bank, tour & travel, insurance, and other segments.Earlier Google Used to send all Adsense check & pin via Bluedart courier to Indian publishers.Even PAN cards, credit/debit cards, new bank account passbook, Visa form and other important documents are carried by them.It offers a wide range of consignment no tracking options.When you make a shipment with Bluedart it generates unique tracking ID (11 digits) which can be used to track current parcel status. Most of the courier store tracking information for 30 days.But Bluedart extends 15 days more, it stores data 45 days from the date of dispatch.After 45 days the tracking data deleted by their auto robot.It means you are no longer eligible to view the parcel status with your air waybill number. 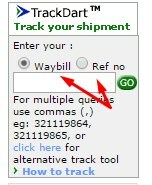 This is the most important part of this article.You can see parcel status when you enter right tracking code.People got confused after having the shipment receipt on their hand.It contains multiple numeric codes but all are not the consignment numbers.Find 11 digits code (i.e 11854759654) that appears below the barcode.It is located in the middle portion of the receipt. Keep it safe until your item is delivered to you. Ok, let’s explore the ultimate 5 simple ways, which available for Blue dart tracking status.I will first start with the official tool provided by Bluedart. In case having reference number send mail to trackref@bluedart.com.If you want automated reply regarding updated shipment status to send mail to intimateme@bluedart.com following the same guideline. ICICI has their own tracking system.They have integrated Bluedart API for tracking the shipment.All ICICI bank account holders can track shipments with Bank A/c Number / Loan A/c Number / Demat A/c Number. These are all tested & working tracking methods.Before tracking with any third party site I always recommend you to track only with the official website which I have mentioned in above article.If you know other blue dart tracking sources, please add it through comment box. Thank you admin for this post.Blue Dart, Aramex, DTDC all these couriers have very good tracking tool.